Chelsea Green Publishing Company, 9781933392240, 299pp. It's not often that someone stumbles into entrepreneurship and ends up reviving a community and starting a national economic-reform movement. But that's what happened when, in 1983, Judy Wicks founded the White Dog Caf on the first floor of her house on a row of Victorian brownstones in West Philadelphia. After helping to save her block from demolition, Judy grew what began as a tiny muffin shop into a 200-seat restaurant-one of the first to feature local, organic, and humane food. The restaurant blossomed into a regional hub for community, and a national powerhouse for modeling socially responsible business. Good Morning, Beautiful Business is a memoir about the evolution of an entrepreneur who would not only change her neighborhood, but would also change her world-helping communities far and wide create local living economies that value people and place as much as commerce and that make communities not just interesting and diverse and prosperous, but also resilient. 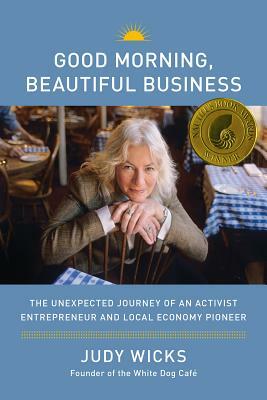 Wicks recounts a girlhood coming of age in the sixties, a stint working in an Alaska Eskimo village in the seventies, her experience cofounding the first Free People store, her accidental entry into the world of restauranteering, the emergence of the celebrated White Dog Caf , and her eventual role as an international leader and speaker in the local-living-economies movement. Her memoir traces the roots of her career - exploring what it takes to marry social change and commerce, and do business differently. Passionate, fun, and inspirational, Good Morning, Beautiful Business explores the way women, and men, can follow both mind and heart, do what's right, and do well by doing good.